During the campaign I predicted that if Obama were elected, we would see an effect on the psyches of young black men and women that would elevate their self-esteem and pay dividends in better education, lower crime rates, etc. Whether that happens or can ever be proven statistically remains to be seen. But, there are already anecdotal stories of Barack and Michelle Obama inspiring young black men, women and children to reach for things they would have otherwise thought beyond their grasp. I received this picture in my email last week. 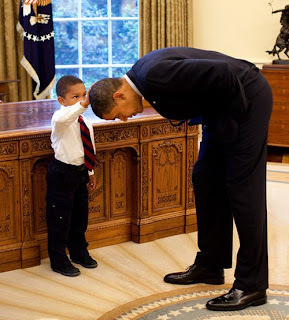 Reportedly, the boy told President Obama he wanted to feel his hair because he just could not believe without touching for himself that one of "us" was in the White House (does this remind anyone of the story of Doubing Thomas?). He wanted to feel Obama's hair because he wanted to know if the President's hair felt just like his. This picture touches me deeply. As someone growing up just after the Civil Rights movement, I can appreciate just how far we've come in a generation and the hope this gives for the future. I saw that picture last week too.. I love it.. so heartwarming and inspirational. This picture speaks volumes for all of us.